Policy on EMFs in the UK, set by Government, is made up of exposure limits plus certain precautionary measures. Several inputs went in to forming the policy, including scientific advice from the Health Protection Agency and the stakeholder process SAGE. You can read the details of all those by following the links. Here, we set out the policy as it stands now, with particular reference to power lines. See the box on the right for other places where the UK Government expresses policy on EMFs. Exposures to the general public in the UK should comply with the ICNIRP 1998 exposure limits in the terms of the 1999 EU Recommendation. both applying where the time of exposure is significant, essentially homes, other places where people might stay overnight, and schools. distribution substations: encouragement to site them away from homes, but no specific requirements. electricity companies design their overhead power lines so that they are compliant even directly underneath the line where the fields are highest. There is no need for any restrictions on how close you can get to a power line in order to comply with the limits. similarly, electricity companies design their underground cables so that they are compliant even directly on top of them. There is no need for any restrictions on how close you can get to an underground cable in order to comply with the limits. for substations, the closest you can get to them is set by the perimeter fence, and electricity companies design them so that they are compliant even right up against the perimeter. There are no restrictions in the UK on how close a home can be to a power line, underground cable, or substation, or vice versa. The policy is set out in the Written Ministerial Statement of 2009 (formally, this was the Government's response to SAGE's First Interim Assessment). The policy for power lines has two key planks: compliance with the 1998 ICNIRP exposure guidelines in the terms of the 1999 EU Recommendation, and a precautionary policy called "optimal phasing". All the practical details needed to apply the policy of compliance with exposure limits are contained in a Code of Practice. This says what land uses the limits apply to, what conditions compliance is assessed for, how accurate the calculations need to be, and so forth. Part of the system for establishing compliance that the Code of Practice establishes is a list of equipment that inherently complies with the exposure guidelines, and that can be found in this section of this website. And the practical details of the precautionary policy of optimal phasing are contained in a second Code of Practice. 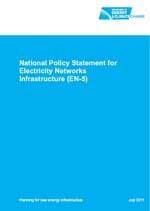 For low-voltage distribution networks, the agreed precautionary measures are set out in Engineering Recommendation G92 published by the Energy Networks Association. This implements the outcome of SAGE's Second Interim Assessment.